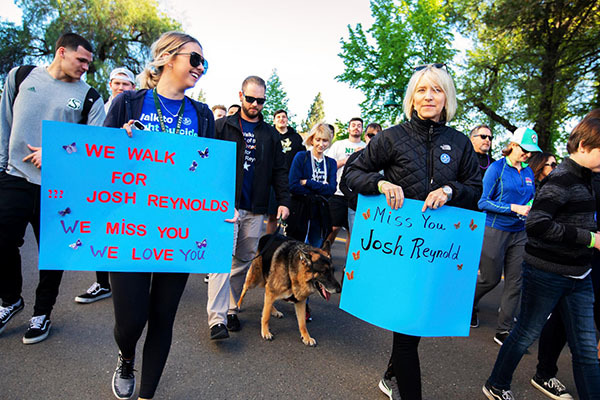 Sacramento State put the spotlight on suicide prevention in April with a pair of powerful events. On Monday, April 8, hundreds of Sac State students and other members of the campus community walked through “Send Silence Packing” in the Library Quad. The Active Minds national traveling exhibit of more than 1,000 backpacks scattered around the lawn represents the number of college students lost to suicide each year. And on Thursday, April 11, Sac State hosted its eighth annual Out of the Darkness Campus Walk, which kicked off at The WELL with a resource fair at 4 p.m., followed at 5:30 p.m. by the opening ceremony and a 2-mile walk across campus. The “Why I Walk” chalkboard remained in the lobby of The WELL through Friday, April 12, for people to share messages of hope or memories of a lost loved one. New this year was the Out of the Darkness #10for10Challenge, which encouraged people to post videos on Instagram Stories of themselves doing pushups, tagging @outofthedarknesswalkcsus. The campus community and visitors were invited to walk among the “Send Silence Packing” backpacks, many donated by grieving families and friends in memory of loved ones. Personal stories and photographs were attached to some bags. 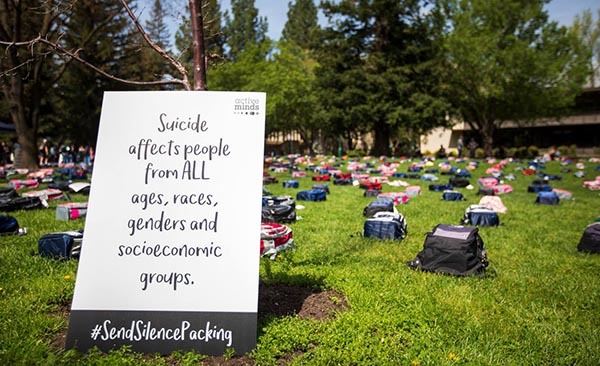 “Send Silence Packing,” currently on a cross-country tour of college campuses, was created by the nonprofit Active Minds to promote greater engagement on the topics of mental illness and suicide. Representatives of Sac State’s chapter of Active Minds and SHCS were present to offer support and alert students to campus resources. Half of all students who have suicidal thoughts never seek counseling or treatment, Active Minds reports. The University registered 1,519 walkers in 2018 and raised $16,952.50 for the American Foundation for Suicide Prevention (AFSP) and its education and prevention programs. In 2017, the 950 participants donated $13,667 for AFSP’s programs. The goal this year was to raise $20,000 for AFSP’s efforts. The opening ceremony includef performances by Sac State students Dana Harrison, this year’s Miss Central California, and Andrea Cronin. Among the speakers were University President Robert S. Nelsen and his wife, Jody; Noel Mora, president of Associated Students Inc. (ASI); Sacramento Mayor Darrell Steinberg; and Assemblyman Kevin McCarty, who talked about Assembly Bill 1689, the College Mental Health Services Program. Organizers say that walk participants show their support for students at risk, survivors of suicide, and anyone who has been touched by a suicide. The issue is particularly important to the Nelsens, who lost their only child, Seth, 25, to suicide in 2001. A campus-wide message from President Nelsen urged active engagement. “This is a call for all students, organizations, departments, faculty, staff, and community members to come together as Hornets," Nelsen wrote, "not only to remember and honor those whose lives have been lost to suicide, but to take action to help raise awareness surrounding the topic of mental health and suicide so that no student ever feels alone or afraid to seek services.